Spouse Depressed: What Can You Do? On your wedding day you could never imagine that depression could cloud your lives to the degree it can. Depression can take your spouse hostage and change how they conduct their lives and how they interact with you. It can also confuse and frustrate you. 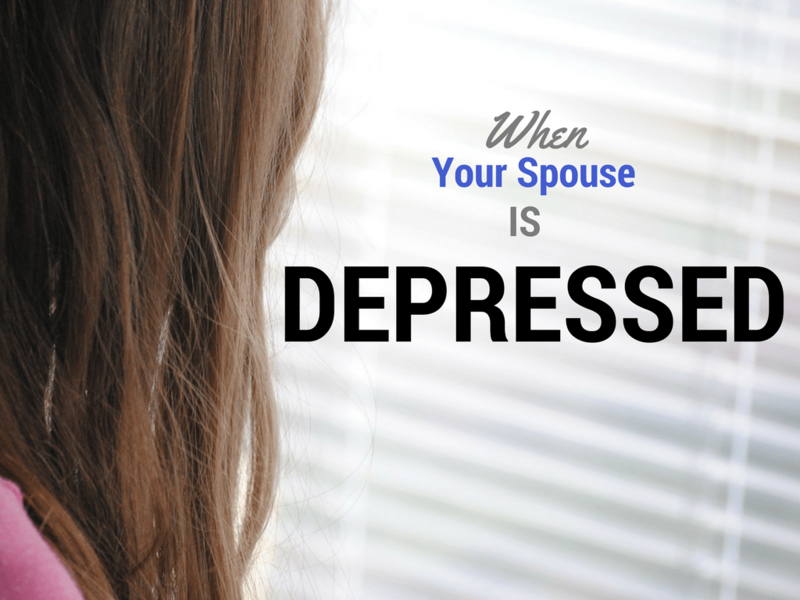 You want to help but you don’t know how to help your spouse who is depressed without making matters worse. Can you relate to what they’ve lived through with their depressed spouse? It’s understandable why some couples “drift apart.” Depression effects both of you in so many ways. It drags you both down and changes things on so many levels. • CAN A CHRISTIAN BE DEPRESSED? “At the Smart Marriage Conference in July 2010, we attended a session called ‘Marriage and Depression: Coping With Depression As A Couple.’ The session leaders, Dennis Lowe, Ph.D and Emily Scott-Lowe, Ph.D told us that they called the depression in their marriage the unwelcome intruder. Why? By viewing the depression as an unwelcome intruder, a couple has an easier time uniting to meet this external challenge. They are not angry at each other. They are angry at the unwelcome intruder in the relationship. “Don’t focus on the illness. What you can do instead is to take extra care of your marriage while your husband, or wife deals with the depression. Make a list of the valuable things you get from your marriage. And work on ways to keep getting them while your spouse is unable to provide them. If you have additional advice or hope you can share, please “Join the Discussion” by adding your comments below. (USA) I am finally admitting there is a problem I can not solve on my own. My wife of 5 years is not happy with her job, me or her life. She has ignored my requests to seek counseling; either a pastor or a therapist. Regardless of what I do she finds fault. I am 58 and out of options. Any suggestions are welcome. (ETHIOPIA) M, Move on, life is too short & there are only too many tomorrows. If there is no way you can change your wife, change your situation. And if it is that important for you to give a marriage another chance I don’t think your age will be as much of an impediment as is your state of mind. So, go! I’m sure, you will get it. Please, do not believe that marriage can be discarded. Changing “your situation” is not good advice. And changing your wife is not possible. You can walk beside her and show her the love she deserves as a person made in God’s image and you can pray for her. But don’t ever believe that casting someone aside because things are difficult is considered a “solution”.